Switches and things you may or may not recognize… but, you know, don’t worry, not only are there hundreds of presets, but randomly switching presets is a lot of fun. Permut8 is the kind of thing that inspires the dreams of people who love digitally-manipulated sound. From legendary Swedish developer Magnus Lindström (Malström in Reason, MicroTonic), it’s a digital delay gone very, very mad. Think delays, flangers, bit crushing, beat repeating, and “circuit-bent” digital insanity. The core of the idea is a 12-bit digital delay with variable sample rate, all controlled by a programmable processor. That lets you do things you … shouldn’t. 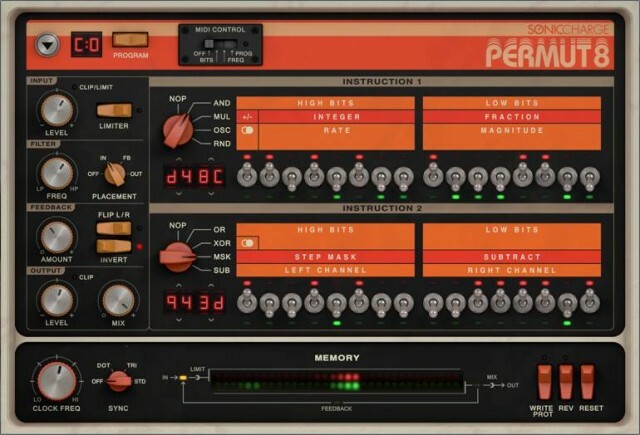 Various digital operators let you mangle and manipulate sounds, for effects that can be sonorous and beautiful or clangy or hideously-distorted, subtle or extreme, or any combination. You can get some idea of what this means by listening to the sound samples below. It’s raw but delicious – you know, like sushi. I’ve started playing with it and I’m already in love; full review soon.